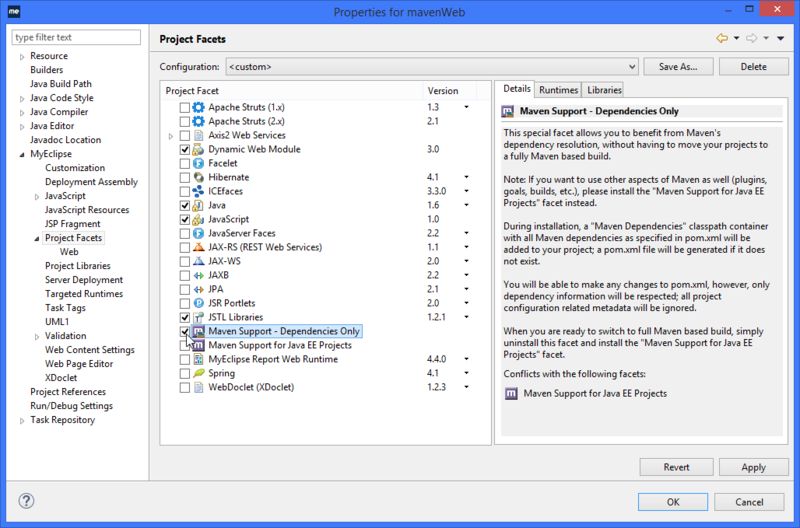 If you like using Maven to manage your projects, check out the MyEclipse IDE with its dependencies only mode, allowing you to take advantage of just this feature. You may have already discovered the joys of managing your projects with Maven, thanks to a virtually endless range of features it has to offer. Whether you are a newbie or a pro, using it in MyEclipse will take it to a whole new level if you are looking for a better experience inside an IDE. You might be used to the fact that with Maven you can manage a project's dependencies, builds, reporting, and documentation from a single place. Maven dependency management is one of the best-known Maven features, and is one of the areas where Maven excels. However, exploiting only this feature is typically not possible - you would need to go almost all the way with a Maven-based project configuration, adding and configuring Maven plugins, dealing with profiles, and goals. If you don't have the time or the need to go through the works, MyEclipse jumps into the picture, offering the Dependencies Only mode, which has actually been available since MyEclipse 2015. If you haven't tried our full-stack MyEclipse IDE, now there are more reasons to do so! MyEclipse Stable 2.0 is out, bringing to you Angular 5 and the very latest CLIs support, as well as improvements in TypeScript, DevStyle, Servers, and more. So how does it work? If you opt for this mode, a Maven Dependencies classpath container is added to your project (as specified in pom.xml - if this file doesn't exist, it will be generated automatically). All the contents of this container is deployed with the project. If you modify the pom.xml file, only data pertaining to dependencies will be respected when the Maven Dependencies container is updated. Dependencies Only mode can be added to both new and existing projects. For a more detailed tutorial on using this mode, click here to see the steps to follow. Remember, if you are looking for the full Maven experience, make sure you choose the Maven Support for Java EE Projects facet. Please see this page for more on Maven support in MyEclipse.